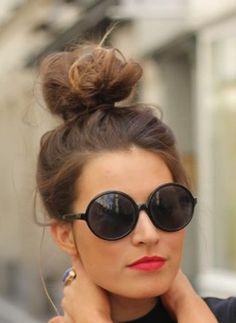 The look- The top knot bun is a beautiful effortless hairstyle that is quick and easy but is on trend and very stylish. It is a perfect way to maintain your hair on a less-than-perfect looking day. The stylish top knot sits high on your head adding extra height to your look. The top knot can be styled messy or sleek depending on the look and is best done with second day hair. This style is suited to mid-long length hair and accessories can be added to make it look extra polished. Top tips for doing a Top knot bun- use a hair tie that isn't thick, otherwise your pins won't hold in place. You should only need to use about 4-7 bobby pins in you bun to secure it. Don't tie your top knot to high and tight on your head- this will avoid you from getting a headache if it is too tight. 1. Brush your hair and gather into a high ponytail. Secure with a hair band. 3. Loop the hair around the base of the ponytail. If you have quite long hair it may have to loop around twice. 4. Get your booby pins and place at least two at the back and two at the front to secure the bun to the crown of your head. 5. Make sure everything is secure and loosen the bun if needed. 6. If you are going for a messy bun, you can pull out bits of hair where you think is needed in order to frame your face. 7. Push down on the top of the bun to loosen up the hair slightly. 8. The top knot bun is complete. For added hold spray some hairspray. Your hairstyle should be able to last all day.